At Tinkle Chiropractic, we are constantly looking for ways to treat our patients with more precision and effectiveness. To identify the exactcause of your condition, we thoroughly evaluate your entire body with cutting edge technology. Digital X-Ray: Digital X-ray is a tool that allows us to evaluate your spinal health more precisely than ever before. Sharper images with minimal distortion results in a clearer X-r ay for a more definitive diagnosis. With digital x-ray, images are captured onto a computer screen, and then are able to be manipulated in a manner as never before to produce the most detailed image possible. As such, less radiation is required to take these images. The x-ray images are displayed in seconds from exposure. We can send and receive images with doctors and hospitals as easily as you send emails. Faster, safer and more comprehensive... that's Computed Digital Radiography. V7 Scanner by Foot Levelers: We use cutting edge technology to scan and assess the arches in your feet. Whether you have neck, low back, hip, knee or foot pain, it could be coming from an unbalanced foundation that starts in your feet. 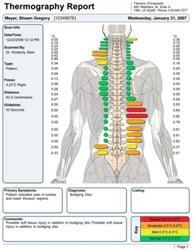 Finding the cause of your pain will help stabilize your spine and the rest of your body. 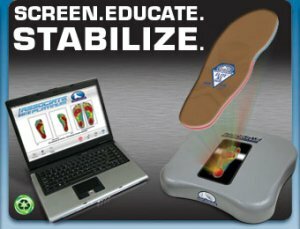 We at Tinkle Chiropractic look at the entire body as a working unit, and will use technology such as the V7 foot scanner to help us identify possible imbalances in your foot that may be contributing to your condition. Healthcare professionals know alleviating pain in one part of your body often requires treating a different part.